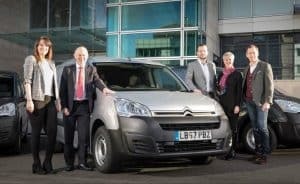 It’s a case of ‘out with the old Citroen vans’ and ‘in with the new Citroen vans’ for catering supplier McCormick – some 166 new Berlingo and Dispatch crew vans have just replaced the existing Berlingo crew vans that joined McCormick UK’s national van fleet in 2013. The Berlingo BlueHDi 100 L2 725 X and Dispatch BlueHDi 120 XL crew vans will be used by McCormick’s nationwide team of retail sales and support merchandisers in the UK. The new additions also come with the Teletrac Navman Smartnav and stolen vehicle tracking system as standard. Tracey Hoare, McCormick UK’s regional business controller for the south, said the company’s duty of care will be boosted due to the new models’ enhanced safety, flexibility and efficiency, while the new sat-nav kit will also help them with dynamic journey planning. Ms Hoare added that Teletrac Navman’s navigation and tracker system will help McCormick analyse how the company manages its geographical coverage more effectively. McCormick (UK) Ltd is the company behind well known consumer and foodservice brands, such as Schwartz, French’s and Frank’s sauces, Hammonds of Yorkshire and Thai Kitchen. All the new vans have been acquired on three-year full maintenance contracts, including tyres, via Alphabet. PSA Group UK has been able to help McCormick tailor its vehicles to its fleet needs more effectively, said fleet director Martin Gurney.